For 47 years, subsequent to the Nigeria-Biafra war, the phrase ‘‘victims of the war’’ has been at arm’s length to the Nigerian government. For long, it has been found wanting in the lips of the Nigerian government bigwigs and elites. Instead, words like; “marginalisation, insecurity, mass killing and minority” are found and implemented in their day-to-day activities. Before, during and after the war till date, the Nigerian government has not bring to an end the marginalisation, mass killings and the minority ideology used on the Biafrans which cemented way for the Biafra-Nigeria civil war. One now wonders if Biafrans were the ones that christened the civil war. Had it been that Gen. Yakubu Gowon on arrival, implemented what the Generals agreed on in the Aburi Accord held in Ghana, there wouldn’t have been any problem at all. Today, these elements that pushed Gen. Ojukwu to seek for the sovereignty of his people are still there, staring at the people of Biafra. Gen. Ojukwu declared Biafra in 1967 because the Biafrans had lost faith in the union due to the fact that they were treated as second-class citizens which still remains the same for Biafrans in Nigeria today. When a good leader witness the brutal mass killings and the unimaginable high rate of marginalisation and suffering deliberately and systematically meted on his people, he strives to defend them no matter what and that was what Gen. Ojukwu did. He never dreamt of trading with the lives of his people for his personal glory or gain unlike the present day governors and Ohaneze-Ndigbo (Igbo Socio-cultural group) in Biafra land. Which good leader will remain quiet after seeing the mass killing of the youths and the gross marginalisation of his people? The answer is no. This marginalisation started with the creation of states and local governments. In 1967, Gen. Yakubu Gowon created 12 states and in the process, carved out Igweocha from Biafra and named it Rivers State so as to make sure they do not join forces with their people to fight for freedom in eventuality of war outbreak. Till date, Biafrans have lesser states and local governments than other constituencies in Nigeria. Politically and economically, Biafrans are marginalised. Are we forgetting the environmental degradation and the deliberate negligence by the Nigerian government in appointments and infrastructural underdevelopment which have narrowed or even murdered employment totally in Biafra land? What about the federal roads in Biafra land that are not in good shape at all? Now, let's take a look at this scenario, in the North that has no river, there is an inland port where containers are shifted from Lagos to Kano and they also have eight (8) good functional international airports and all these are built, maintained and facilitated by the Federal government of Nigeria from the funds accrued in Biafra land. In Biafra land, there are three international Seaports that are not functional including the international airports and the same Federal government that has developed those in the North and West, is maintaining a deliberate mute over that. In Aba in Biafra land, the Nigerian government closed down profitable factories like; Aba Ceramics, Golden Guinea and Glass factories. All these and many more are their marginalisation instincts. 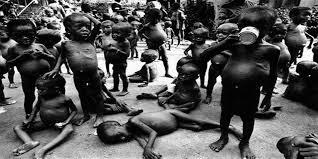 Biafran pregnant women were killed by first opening their stomachs with knives to bring out the baby in their wombs. Biafrans were massacred in their numbers which prompted them to seek sovereignty and protection as that was no longer guaranteed in Nigeria. Biafran youths were massacred and thrown into Ezu River in Anambra State during Governor Peter Obi's regime. Chisco Motors were burnt in the North and Southwest and at the site of these atrocious and abominable acts, the leaders are having good time with their families at their comfort zones, toasting wines at the detriment of their people. Indeed, days are gone when leaders were chosen by the people. Biafrans should know that this new move by the ECOWAS Court in issuing out an order for the Federal government of Nigeria to pay N88bn for the victims of Biafra genocidal war was initiated and masterminded by President Muhammadu Buhari to see if he can quench the fire and the unadulterated call for the freedom of the Biafran people. Your killer can never be your healer. The damages are not what money can solve but only a date for referendum to know the people’s mind. Millions have died for this nobel cause for freedom and emancipation; it will be suicidal for the Nigerian government to push this present generation of Biafrans into carrying arms. Just like Ojukwu and his soldiers then, this generation has not called for war but for referendum. And until a date for referendum is given, there shall be no more election anywhere in Biafra land because the land of Biafra will be against any Biafran that goes out to vote.